Easily serve a wide variety of tasty finger foods, freshly made sides, and signature snacks with this #300 3 Ib. red check paper food tray. Versatile in both design and use, the tray is great for french fries, chicken tenders, mozzarella sticks, and other popular fried favorites, or with cold items such as veggies, fruit, and pasta salad. One-piece SBS paperboard construction ensures sturdy and reliable use, while the open top design allows users to effortlessly top off their tray with assorted sauces, dips, and condiments. Plus, a traditional red check pattern lends a rustic feel to any setting. I really like these trays. They are attractive and can be used for multiple purposes. We serve jumbo all beef hot dogs and banana splits in them. These have a traditional, nostalgic vibe to them, and are sturdy enough for a hearty sandwich. With some deli paper, they look very good & can function as a great plate for diners. We use these for all of our proteins and fried foods at our BBQ restaurant. They hold up very well too all of our products some of which are fairly greasy. these paper food trays are the perfect size for any side. we use them for fries, fried mushrooms, fried pickles, nachos, etc... never have any issues with the not holding up to the task. they are sturdy and they don't get greasy. So much more functional than flat and flimsy paper plates. I'm trying to make these the new trend in picnicware. Great for camping - burnable. Affordable. Also, they are thick paper and therefore more environmentally friendly than cardboard or styrofoam. It takes a lot of liquid to soak through one of these. we use souther champion paper food tray for our nachos on food truck. it is perfect for very casual food setting like serving nachos or hotdog! We really like these trays, we use them for our food baskets with a checkered paper liner and they make the food look even better! They hold up well and are quick and convenient to use. Not a lot that can be said about this product. Most that work with food are familiar with them. Quality is great, and this price truly can not be beat! I like these slightly larger trays more so than the smaller ones. They work well and hold up. You would be surprised how much food they hold. Classic red check design on these 3 lb paper food tray. Great for all sorts of foods, hot or cold. Grease resistant, versatile, and a great value! Bought these for my daughters school fundraiser and there was more than enough and I was very happy about that. the quality held the frito pies and the tray didn't get soggy or fall apart. they kept up very nice. These trays are the best! very durable, we load them up with everything from mac n cheese to pulled pork nachos. Never had an issue with them leaking. Make sure to order double what you think you may need, they go by fast. we use the collection of these red/white food trays to match and serve main and dessert - side and main - appetizer and main, etc. They are coated so if yuo are serving something oily it will not stain the tray. Convenient size. Comes in plastic sleeves. These are so fun! We got them for the neighborhood block party as each home had a food station at the end of the driveway and we thought the easiest way to serve would be these trays. Great trays. Used them for hot dogs, salads, pretzels and more. They are strong and cheap cost. I even use them for my kids at home. This 250 pack of food trays is a good value. 3 pound food trays with red checkered pattern on them. Great for french fries or side dishes. 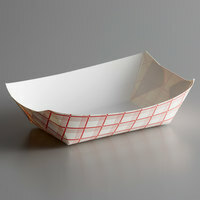 These paper food trays are great for any bar or restaurant looking for an economical choice for a disposable food tray. Nice red and white pattern on the outside looks nice too. I use these food trays in a lab. We use them every single day and they are microwaved with sample in them. They last for ages! This is a big testament to how durable they are. They stack well too. We love the style and appearance of these red check food trays. The trays work great for our food stand and serves fries perfectly. Perfect size for doing an outside event, food show, or festival. You get 500 in a order and keeps cost down. Fast cheap and easy to get your name known in the community. These are excellent little trays. My school used to use them at the nacho bar and they worked perfectly to fit chips, toppings, and cheese. These trays are great to put sides in. They hold a lot of food and anything that may have a little liquid doesn't leak out of them. Heavy duty yet light to handle. This paper food tray is a great single use product for concession stands, food trucks, picnics, etc. Eye catching design. I've bought two sizes in these trays so far. These ones I prefer for dishes like salads. The extra room gives the dish a cleaner look, and customers are happy with how much they get in them. would definitely recommend! quality is good but it could have been better , not five but four star , on the other hand perfect for burgers , hot dogs and fries .. These little trays are the perfect size for our loaded bratwurst! We also use them in our bakery and the red/white checked pattern is the right look for our bakery! Two thumbs up! These paper food trays are great. We use them for our lunch, holding a sandwich and small bag of chips. They are very sturdy. Highly recommend. Standard paper food trays for any type of concession stand. They do the job very well and hold up pretty decent to a wide variety of foods. We line these Paper Food Trays with the Deli Wrap Wax Paper and use them to wrap raw beef, pork, poultry and sausage in our butcher shop. We then wrap in butcher paper. Excellent product. Very strong paper trays. It can hold a large amount of food very well even if it is heavy. It only works well with liquidy foods. They heavyweight trays are perfect for serving food on the go. I use them for our Bike Night and put hot dogs and pulled pork sliders in them and they are the perfect size. These are the ideal food trays. They work well for what I needed them for. I am able to serve my fries, chicken and other goodies in style and I love it. Perfect for chicken fingers and fries. Hold up great with lots of food and toppings. nice price for 500 case. We will continue to buy. We use these for nachos and they hold up very we'll. The thickness and height of the tray is perfect to avoid spills on the customers. We use these for chips and fries and various other finger foods, a very good value at this price. Must have for serving bar food. You can also use the 3 lb. Red Check Paper Food Tray 500 / Case tray to serve chicken. This tray is great for serving. I was able to put 7 legs and 2 thighs on it. How awesome is that. Used these for a carnival themed birthday party. They held up well and didn't leak. They were perfect for nachos and hot dogs. will order again. Been using these trays for years and they work great. We use these 3 pound trays for our large items and it works just fine. Great paper food tray to use on our food truck. They are very sturdy and can hold plenty of food. Highly recommended for the price. I notice that these food trays get soft quicker than some. Not sure why, but I could leave it full of fries for 1 minute and the tray gets hot and soft, so I end up using another tray. The others don't do that, so the material may not be as strong. However, due to that, I don't put the food in the tray until I'm read to pass out the food. These trays are excellent . They hold our jumbo burgers hot wings fries and every other items we sell perfectly. Definitely worth the money and I'm thinking about buying more! Nice to have as a added pantry server. We half used they for fries ad chicken tenders as well as apple crisp. Can hold a nice amout of food and save you on dish washing. Perfect size for a pulled pork sandwich and a side of slaw!! Use these to serve every sandwich out of BBQ stand and food truck. Heavy enough to not fold and handles liquids very well. Would also be good for fries and other items. Man I love these! I use to get these from somewhere else... same 3 #ers... But when I got these I thought I was sent the wrong size as they were larger... but they were the correct size!!! So I was able to place a couple of hot dogs and Jalapenos or Pickles, or a side of coleslaw etc... right in the same tray!! They are awesome. They also hold up well with the moist food which is an added bonus. I did not see the need to double em up like with others I tried. these 3 pound red check paper food trays are a super handy product. they are really well made and hold up really well. we even use them to transport food from the fryer. great price and ships fast. Another great foodtray product from Webstaurant. High quality, soak resistant construction with strong seams and corners. A must have for concession stands, lunch programs, office cafeterias, etc. Indispensable in any foodservice, and very economically priced. These boats work perfect at our costal Cantina! We serve tacos, burritos and chips in them!! We buy them in more than one size and are very please with the product! I got these to use for my Togo baskets instead of using the Styrofoam plates with lids these trays hold well and stay strong will be buying more. We purchased these to use as the base for gift baskets. We placed a mini apple pie, a small can of soda, a box of Cracker Jack, and various other treats inside. The baskets were tied with cello and ribbon and held up well. These are good trays for serving large sides or lunch deals. They are strong and hold up well with fried food. Very cool and unique design. These are nice trays for serving freshly made subs and sandwiches!! Great for sides of fresh cut fries and mozzarella sticks!! Works great for mise en place!!! The three pound trays are great for a combo. Hot dog, fries, hamburger, fries. It's not too big so that the customer doesn't think they are not getting enough food. Excellent product for concessions, vending large outdoor events, or even retail food operations. The paper trays are sturdy, attractive, and have plenty of room for various types of food. Recommended product.